First of all, I am going to suggest how to be rid them at the door. Usually keeps most away. Because this usually means, no sale today. If they start speaking to you in the language you speak, why not create you own language? Then nobody would understand! While your at it, why not add a nice wave. I’m very sure they will just leave. If not, their probably not smart enough to understand you don’t want them. Show your scrawny skinny body, they will probably freak on you! But then again, they might be back to sell you enhancement products. Express the anger inside you. Rage at them, and save you cheerful self for your close friends or family! Great way to scare the living … out of them. A guarantee that they will take a mental note not to come again. The most commonly used way to get rid of telemarketers. If you haven’t tried, you should. Another great way to make them never come back. They should be scared, after they have heard what happens when your dogs sense company. How about repeating what they say? Or better yet, start asking about that pair of magic underwear! Works most of the time, they’ll add you to the do not call list (or so they say). A great way to mess with them on the phone! If you don’t have caller ID, then you should get it. Something that will guarantee a way not to pick up most telemarketer calls. Let it out now, and have a brighter day! A great way to bring up a bad day (or so I may think). Gives them a “clear” message not interested, and do not call again! A device used to filter out telemarketer calls. One of the best little ingenious devices ever invented. There are a lot of people messing with them. Just check out YouTube for some videos… they’re pretty funny too. 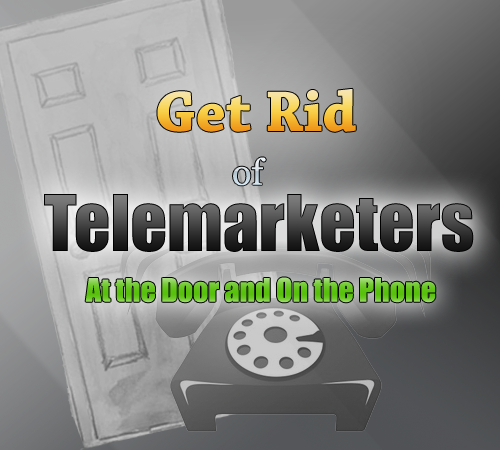 Feel free to try any of these methods on telemarketers! I have tried a ton of these myself. Now, if you’d like, please do not feel obligated to comment about what you did!